Super-soft 4" makeup powder puffs have a pretty, practical rayon ribbon on back. 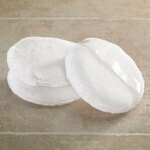 Face powder puffs are made of acrylic pile and foam fill that are hand-washable. Set of 3.